Photodynamic therapy, which takes advantage of photons to generate therapeutic reactive oxygen species, has emerged as an alternative to traditional surgery, chemotherapy, and radiotherapy to combat cancer [1, 2]. As a non-invasive treatment, photodynamic therapy causes fewer harmful side-effects than the conventional treatments . Nanotechnology has demonstrated potential biomedical applications by combining nanomaterials and photosensitizers for collective delivery, imaging, and photodynamic therapy [4-6]. With functional nanomaterials, multi-purpose platforms, including synergistic and cascaded cancer therapy, have been achieved [7, 8]. Metal-organic framework (MOF), an emerging type of crystalline material formed by coordinating metal ions and organic linkers, has attracted significant attention because of their porous structures and unique properties at the nanometer scale [9-11]. In particular, MOF nanoparticles have shown great potential in biomedical applications owing to their uniform and well-defined structures [12-14]. Porous structure made MOF an ideal candidate as a delivery platform for disease treatment [15-18]. The preparation of nanoscale porphyrinic MOF nanoparticles solved many issues associated with porphyrinic photosensitizers, such as aggregation, self-quenching, and uncontrollable in vivo administration for cancer therapy [3, 19]. However, intracellular glutathione (GSH) is fatal to the reactive oxygen species generated from photosensitizers, especially in tumor cells which have much higher concentration of GSH than normal cells [20-23]. So, it would be ideal to develop photosensitizer-based MOF with GSH depletion function. Recently, the design of multifunctional MOF nanomaterials by integrating inorganic nanoparticle into MOF (NP@MOF) has opened new paths to obtain enhanced, collective, and extended novel physicochemical properties [24-27]. For example, efficient and selective hydrogenation has been achieved by incorporating Pt nanoparticles into MIL-101 (Fe) nanoparticles (Pt@MIL-101)  and heterodimer made of upconversion nanoparticles and MOF was demonstrated to be a promising platform for NIR-induced photodynamic therapy for efficient cancer treatment . Core-shell gold nanorod@MOFs provided a combined photodynamic and photothermal therapy platform . However, the reverse structure of MOF-integrated inorganic nanoparticle (MOF@NP) with multifunction has not been reported yet. Inspired by the novel properties generated from these NP@MOF hybrids, we developed a facile in-situ growth method to integrate MOF into inorganic nanomaterials. In this method, MOF nanoparticles were used as seed to grow inorganic nanomaterial for potential biochemical applications. MnO2 nanosheets have been studied as a novel fluorescence sensing platform for biochemical detection [29-31]. The intrinsic adsorption of dyes and single stranded DNA on MnO2 nanosheets induces a significant fluorescence quenching through fluorescence resonance energy transfer (FRET), allowing fluorescence-based target quantification [32-35]. Many studies have proved that Mn ions have cytotoxicity on various cancer cell lines. The exploration of Mn-based photodynamic therapy represents an intriguing avenue to the cancer treatment. Thus, we select MnO2 as the inorganic nanomaterial shell to explore the optical property of MOF nanoparticles. We first prepared fluorescent ZIF-8 and hypothesized the MnO2 could quench the fluorescence of ZIF-8 after growing on the surface of ZIF-8. Moreover, ZrMOF nanoparticles were synthesized by growing a layer of MnO2. In this case, we hypothesized that MnO2 could suppress the photodynamic activity of ZrMOF and a recovery of photodynamic activity can be obtained by decomposing the surface layer of MnO2 (Figure 1). Illustration of the in-situ growth method to integrate MOF into inorganic nanomaterials and intracellular GSH-responsive activation of photodynamic activity of ZrMOF@MnO2 hybrid nanoparticles for MRI-guided enhanced tumor therapy. To test our first hypothesis, FITC encapsulated ZIF-8 (ZIF-FITC)  was prepared as shown in figure 2A and figure S9. Aqueous KMnO4 solution was then introduced to the aqueous ZIF-8 nanoparticle solution with vigorous stirring. A structure with ZIF-FITC nanoparticle core and MnO2 nanodot satellites (Figure 2B) was formed quickly upon observing a color change from dark red to brown (Figure 2C). Fluorescence spectroscopy indicated that the fluorescence of the encapsulated FITC was quenched after forming this ZIF-FITC@MnO2 hybrid. However, the fluorescence of FITC in the ZIF-8 nanoparticle was recovered (Figure 2D) after introducing GSH to reduce MnO2 to Mn ions. ZIF-FITC@MnO2 core satellites structure with fluorescence off and on function. (A) TEM of FITC-encapsulated ZIF-8 nanoparticles. (B) TEM of ZIF-FITC@MnO2 core satellites nanoparticles. (C) Digital picture of color change after in situ growth of MnO2 on ZIF-FITC and GSH reduction. (D) Fluorescence turn off by MnO2 nanodots and turn on by GSH. Upon verifying the fluorescence turn-off by MnO2 and turn-on by GSH, we further designed a ZrMOF@MnO2 hybrid using a similar method as the preparation of ZIF-FITC@MnO2 to control the photodynamic activity of porphyrinic MOF. The assembly of porphyrinic photosensitizers to MOF nanoparticles provides many advantages over free photosensitizers in photodynamic therapy. Porphyrinic MOF nanoparticles can accumulate in tumor by the enhanced permeability and retention effect and can then generate cytotoxic singlet oxygen to destroy the tumor. However, as mentioned above, the intracellular GSH can quench the generated singlet oxygen generated by porphyrinic MOF. This is especially problematic in tumor cells, where the intracellular GSH level is much higher than in normal cells. Therefore, depletion of GSH is a promising way to enhance the photodynamic therapy efficiency. Based on these features, we grew a thin layer of MnO2 nanosheet on the surface of ZrMOF nanoparticles for the one hand to control the photodynamic activity of ZrMOF, for the other hand to deplete the intracellular GSH to enhance the photodynamic therapy efficacy. As shown in figure 3 and figure S1, rather than forming MnO2 nanodots, a thin layer of MnO2 nanosheet, demonstrated by TEM, HAADF-STEM, and XPS (Figure S2), was formed on the surface of ZrMOF nanoparticles. Dynamic light scattering indicated good colloidal stability of ZrMOF@MnO2 (Figure 3G). Compared with ZrMOF nanoparticles, the fluorescence of the ZrMOF@MnO2 hybrid was significantly depressed (Figure 4C), although the absorbance did not show a significant change (Figure 4A). The fluorescence depression of porphyrinic MOF is attributed to the FRET between single layer of MnO2 and the porphyrinic photosensitizer in ZrMOF. Singlet oxygen generation is the most important index to evaluate the photodynamic activity of the photosensitizers. Singlet oxygen sensor green (SOSG) was used to monitor the generation of singlet oxygen from ZrMOF and ZrMOF@MnO2 hybrid nanoparticles. 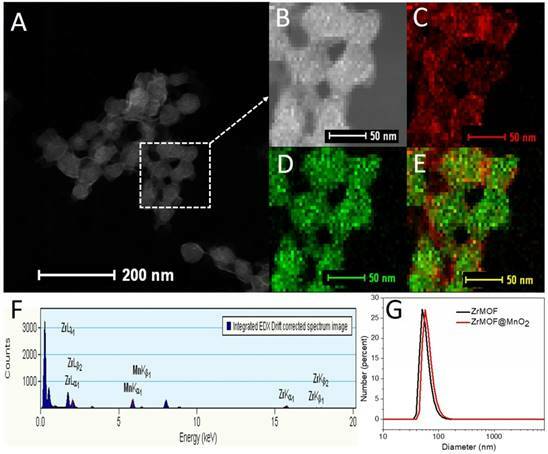 In figure 4D, an increased generation of singlet oxygen was observed when ZrMOF nanoparticles were irradiated with 650 nm laser (200 mW/cm2). In contrast, the singlet oxygen generation from ZrMOF@MnO2 was significantly depressed (Figure 4E), indicating that the thin layer of MnO2 not only quenches the fluorescence but also depresses the singlet oxygen generation of ZrMOF. However, when GSH was introduced to the ZrMOF@MnO2 hybrid nanoparticle solution, the thin layer of MnO2 was reduced to Mn2+ and the GSH was converted to GSSG as the color turned to light brown from dark brown (Figure 4B), resulting in the recovery of singlet oxygen generation (Figure 4F). LC-MS further demonstrated the formation of GSSG from GSH by ZrMOF@MnO2 hybrid nanoparticles (Figure 4G). The recovery of fluorescence from the ZrMOF@MnO2 hybrid after adding GSH also supports the recovery of singlet oxygen generation (Figure 4C). (A) HAADF-STEM of ZrMOF@MnO2. (B) HAADF-STEM image of area of interest used for element mapping. (C) Mn element map. (D) Zr element map. (E) Mn and Zr composite element map. (F) Sum EDS spectrum of area used for element mapping. (G) Dynamic light scattering of ZrMOF nanoparticles before and after integrating into MnO2. (A) UV-vis of ZrMOF, ZrMOF@MnO2, and GSH treated ZrMOF@MnO2. (B) Digital picture of GSH responsive ZrMOF@MnO2. (C) Fluorescence of ZrMOF, ZrMOF@MnO2, and GSH treated ZrMOF@MnO2. (D) Singlet oxygen generation of ZrMOF. (E) Singlet oxygen generation of ZrMOF@MnO2. (F) Singlet oxygen generation of GSH treated ZrMOF@MnO2. To measure the singlet oxygen generation, nanoparticles were irradiated with 650 nm laser (200 mW/cm2). 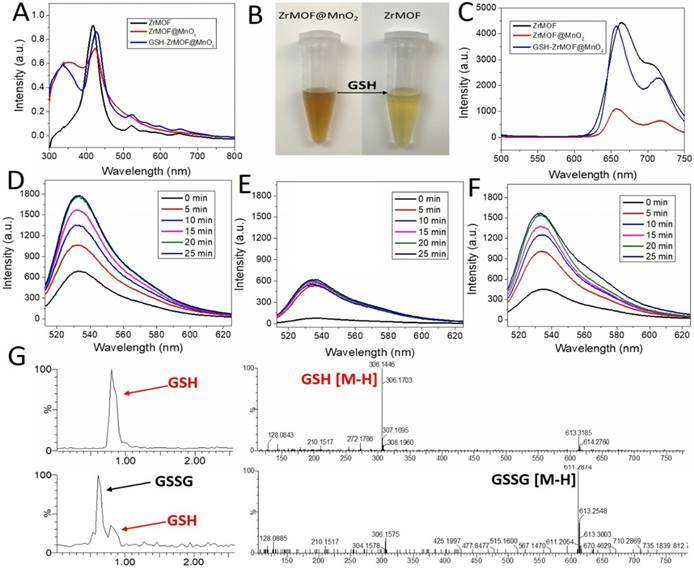 (G) LC-MS of GSH and GSSG from GSH oxidized by ZrMOF@MnO2 hybrid nanoparticles. 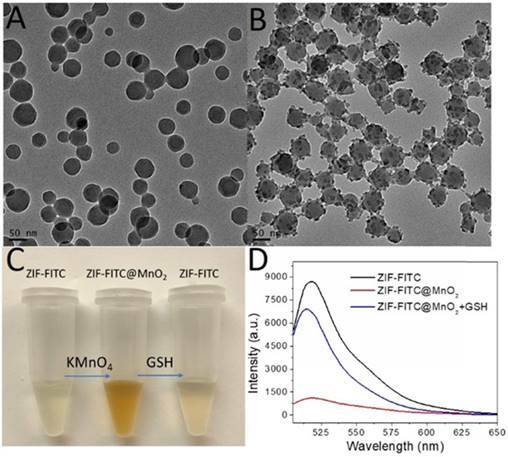 Having demonstrated that the GSH can decompose the MnO2 nanosheet to turn on the photodynamic activity of ZrMOF@MnO2 hybrid, we further studied how the GSH level affects the singlet oxygen generation of ZrMOF and ZrMOF@MnO2 hybrid nanoparticles by treating them with different concentrations of GSH. SOSG probe was first added to the MOF nanoparticle solution. Background from SOSG was measured before laser irradiation (black). After 15 min laser irradiation, generated singlet oxygen was measured (red). Subsequently, different concentrations of GSH were added. Singlet oxygen was measured again immediately after adding GSH (blue). After applying a second 15 min laser irradiation, newly generated singlet oxygen was measured (pink). Significant quenching of singlet oxygen was observed when 0.05 mM of GSH was introduced to ZrMOF nanoparticles and complete quenching was observed when the concentration of GSH was increased to 0.25 mM and 0.75 mM (Figure 5 top). Furthermore, very few new singlet oxygens were generated even when a second 15 min laser irradiation was applied. The same singlet oxygen monitoring protocol was applied to ZrMOF@MnO2 hybrid nanoparticles (Figure 5 bottom). 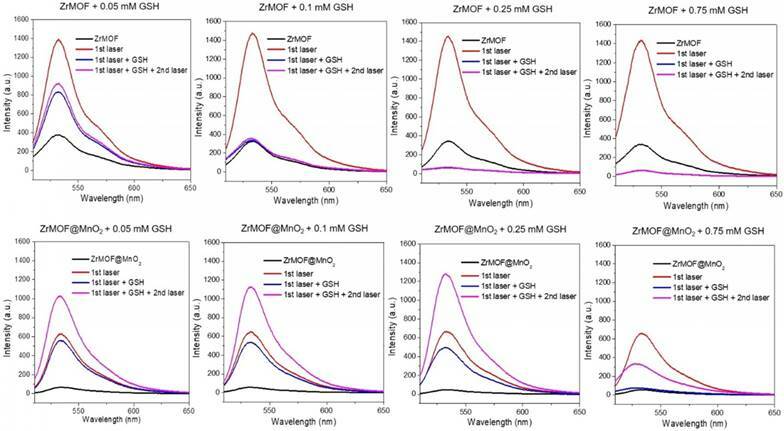 Compared with ZrMOF nanoparticles, much less singlet oxygen was generated from ZrMOF@MnO2 after 15 min laser irradiation before adding GSH due to the suppressing of photodynamic activity from MnO2 nanosheet (red). Upon adding GSH, an increasing number of generated singlet oxygens were quenched as the concentration of GSH increased after the first (15 min) laser irradiation (blue). For example, when the concentration of GSH increased to 0.75 mM, almost all generated singlet oxygens were quenched by GSH, confirming the strong quenching ability of GSH to singlet oxygen. However, the newly generated singlet oxygen was significantly increased when a second 15 min laser irradiation was applied to ZrMOF@MnO2 after adding GSH (pink). This is because an increasing amount of MnO2 on the surface of ZrMOF nanoparticles was reduced to Mn2+ by GSH as the concentration of GSH increased from 0.05 mM to 0.1 mM and 0.25 mM. The elimination of MnO2 from ZrMOF@MnO2 led to the recovery of singlet oxygen generation. However, the generation of new singlet oxygen was depressed again when the concentration of GSH increased to 0.75 mM, because excess GSH were left to quench the newly generated singlet oxygen even though all MnO2 nanosheets of ZrMOF@MnO2 were reduced. The overall GSH effect on the generation of singlet oxygen of ZrMOF and ZrMOF@MnO2 under the irradiation of 650 nm laser was summarized in figure 6A. This in vitro balance study of MnO2 and GSH on the generation of singlet oxygen provides us insight to obtain enhanced photodynamic therapy. The stoichiometry ratio of MnO2 and GSH reaction was further determined to be 1 to 2 by a standard curve, as shown in figure S3. Singlet oxygen generation of ZrMOF (top) and ZrMOF@MnO2 (bottom) with different concentration of GSH. Black: background of singlet oxygen after adding SOSG; red: singlet oxygen generated after 15 min laser irradiation; blue: singlet oxygen generation after adding GSH; pink: generated singlet oxygen after a second 15 min laser irradiation. (A) The summary of GSH effect on the generation of singlet oxygen of ZrMOF and ZrMOF@MnO2 under irradiation of 650 nm laser (200 mW/cm2). (B) The release behavior of Mn from ZrMOF@MnO2 under different conditions. (C) The r1 value of ZrMOF@MnO2 hybrid nanoparticles with and without GSH. (D) T1-weighted images of mice at different times after intravenous injection with PEGylated ZrMOF@MnO2 hybrid nanoparticles. To evaluate the photodynamic therapy efficiency of ZrMOF@MnO2 hybrid nanoparticles, we next conducted MTT assay with ZrMOF@MnO2 using ZrMOF nanoparticles as control. As shown in figure 7A, ZrMOF@MnO2 displayed higher cytotoxicity ability compared to ZrMOF under same laser irradiation. In addition, the flow cytometry of cell apoptosis and stained live/dead cell also demonstrated a significantly enhanced photodynamic therapy from ZrMOF@MnO2 hybrid nanoparticles compared to ZrMOF nanoparticles with the same laser irradiation (Figure S4 and S5). Therefore, the depletion of GSH by MnO2 can maintain a high level of singlet oxygen generated by ZrMOF, thus improving the cell apoptosis efficiency. The reduction of MnO2 by GSH not only depletes GSH to enhance the photodynamic therapy efficiency but also offers us an opportunity to take advantage of the reduction product, Mn2+, for magnetic resonance imaging-guided photodynamic therapy. We first studied the release behavior of Mn in vitro using ICP by treating ZrMOF@MnO2 with sodium acetate (pH=5.5) and GSH (5mM) which are similar with the tumor microenvironment. As shown in figure 6B, a negligible release of Mn (7%) was observed after 48 hours when pH=7.4. Although MnO2 can be decomposed by acid, pH=5.5 is not strong enough to quickly decompose all MnO2 shell on the surface of ZrMOF nanoparticles. Only about 12% of Mn was released after 48 hours when pH=5.5. However, MnO2 is very sensitive to GSH. About 75% of Mn was released in 1 hour when GSH=5 mM. After 24 hours, the Mn release reached 84% which is almost the maximal level (figure 6B). Thus, GSH plays a major role to decompose MnO2. T1 relaxivity were compared with and without treatment of GSH. A much higher longitudinal relaxivity r1 was obtained when MnO2 shell of ZrMOF@MnO2 were reduced to Mn2+ in figure 6C, indicating that a GSH-stimulative activation of T1 contrast can be developed for tumor imaging-guided therapy. To test the potential of ZrMOF@MnO2 hybrid as an MRI contrast agent, PEGylated ZrMOF@MnO2 hybrid nanoparticles were intravenously given to mice with U87MG tumor. Figure 6D showed a significant T1 contrast improvement at the 8th hour after injection from the time dependent T1-weighted images of mice, indicating the tumor accumulation of ZrMOF@MnO2 hybrid nanoparticles and the reduction of MnO2 to Mn2+ by GSH. Considering both the Mn release behavior and T1 contrast information, the laser irradiation for in vivo photodynamic therapy was conducted at the 24th hour after intravenous injection. (A) Cell viability of U87MG cells with different treatments. (B) The curves of tumor growth after various treatments. (C) Survival rate of mice with U87MG tumor after various treatments. (D) The images of H&E stained tumor sections after various treatments. Encouraged by the enhanced in vitro photodynamic therapy efficacy of ZrMOF@MnO2 hybrid nanoparticles and the magnetic resonance imaging-guided therapy information, we further investigated its photodynamic therapy using mice with U87MG tumor. The mice were intravenously given two doses of PEGylated ZrMOF and ZrMOF@MnO2 nanoparticles every four days for a total of two times. The tumor was irradiated by 650 nm laser at 24th hour following each injection for 15 min at 200 mWcm-2. As shown in figure 7B, the tumors of mice grew quickly when treated with PBS or PBS + laser. 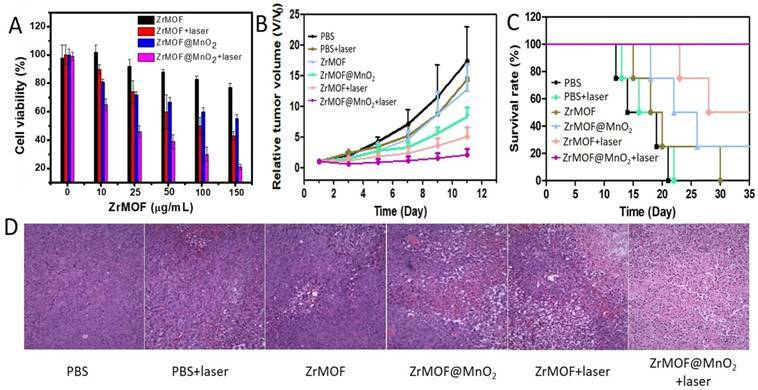 However, the tumors of mice treated with ZrMOF@MnO2 hybrid nanoparticles showed significant tumor eradication after laser irradiation. In contrast, ZrMOF-treated mice showed limited tumor inhibition with laser irradiation. The tumor volumes of mice after treatment are presented in figure S6. Furthermore, the mice treated with ZrMOF@MnO2 hybrid nanoparticles and laser irradiation achieved longer survival times and higher survival rates than the control groups (Figure 7C). This remarkable tumor inhibition is attributed to the intracellular balance of GSH and MnO2 and the photodynamic activity of ZrMOF nanoparticles accumulated in tumor. After photodynamic therapy, major organs and tumors were obtained for histological analysis. The haematoxylin and eosin (H&E) stained images of tumors from different groups of mice are shown in figure S7. No obvious pathological changes of major organs were observed (Figure 7D). Despite the enhanced photodynamic therapy efficacy from ZrMOF@MnO2, no obvious mice body weight reduction was observed. 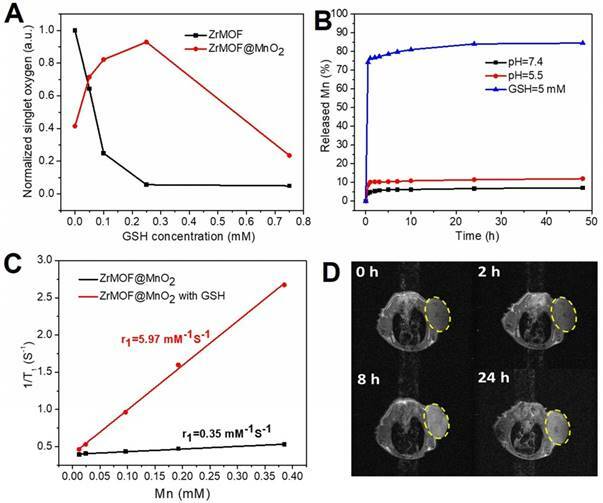 These results demonstrated that ZrMOF@MnO2 hybrid nanoparticles have enhanced photodynamic therapy efficiency owing to the intracellular balance of GSH and MnO2. In conclusion, we have developed a facile in-situ growth method to grow MnO2 on the surface of MOF nanoparticle and obtained a core-satellites structure with fluorescence off and on function and a core-shell structure with photodynamic activity off and on function. MnO2, as an efficient quencher, not only depressed the fluorescence of dye-contained ZIF-8 but also inhibited the generation of singlet oxygen of porphyrinic ZrMOF. Moreover, we figured out how MnO2 and GSH affect the singlet oxygen generation and achieved an enhanced photodynamic activity. 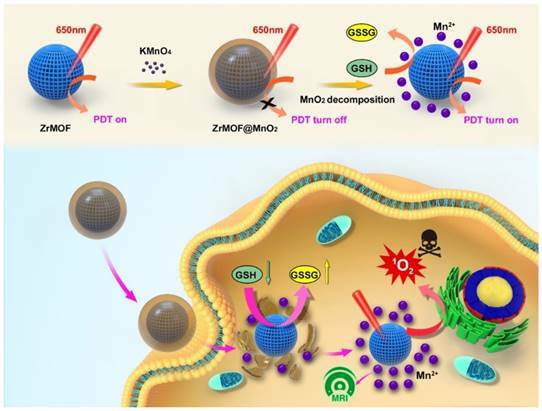 Although the quenching of generated singlet oxygen by MnO2 and GSH is harmful to the photodynamic therapy, an enhanced photodynamic therapy was achieved from ZrMOF@MnO2 hybrid nanoparticles by balancing the MnO2 and GSH. Overall, these results demonstrate a rational design of core-shell ZrMOF@MnO2 hybrid to reduce the intracellular GSH and trigger an enhanced photodynamic cancer therapy. This work highlights the impact of inorganic nanomaterial on the MOF properties and provides insight to the rational design of multifunctional MOF-inorganic nanomaterial complexes. Synthesis of ZIF-8: In a typical synthesis of 50 nm ZIF-8 nanoparticles, Zn(NO3)2 (150 mg) was dissolved in 7 mL of methanol. Then, 2-methylimidazole (330 mg) was seperately dissolved in 7 mL of methanol, and the resulting solution was injected into the Zn solution with vigorous stirring. After 5 minutes, the mixture turned cloudy. The reaction was stopped and the ZIF-8 nanoparticles were washed with methanol and resuspended in DMF for further use. Synthesis of zirconium-based porphyrinic MOF (ZrMOF) nanoparticles: In a typical synthesis, ZrOCl2 (30 mg), meso-tetra(4-carboxyphenyl)porphyrin (TCPP) (10 mg) and benzoic acid (270 mg) were dissolved in 10 mL of DMF in a 20 mL vial. The solution was sonicated and incubated in an oil bath at 90°C for 5 h. The resulting product was collected by centrifugation, washed with DMF, and resuspended in DMF for further use. In situ growth of MnO2 nanodots on ZIF-8 nanoparticles: Typically, ZIF-8 nanoparticles were washed with methanol and finally redispersed in deionized water. Aqueous KMnO4 solution (2mL, 1mg/mL) was introduced to the aqueous ZIF-8 nanoparticle solution with vigorous stirring at room temperature. After 30 min, the resulting ZIF-MnO2 core-satellites hybrid nanoparticles were washed with water and resuspended in water. In situ growth of MnO2 nanosheet on the surface of porphyrinic ZrMOF nanoparticles: In a typical synthesis, ZrMOF nanoparticles were first washed with water and resuspended in water. Aqueous KMnO4 solution (2mL, 1mg/ mL) was introduced to the aqueous ZrMOF nanoparticle solution with strong stirring at room temperature. The resulting mixture was incubated for 30 min. Finally the product was washed with water and resuspended in water. GSH-activated in vitro and in vivo MRI: Different concentrations of aqueous ZrMOF@MnO2 nanoparticles were treated with GSH for 5 min. The resulting solutions were scanned by a MRI system. For the in vivo MRI study, PEGylated ZrMOF@MnO2 nanoparticles were intraveniously injected into U87MG tumor-bearing mice. Magnetic resonance imges were aquired at different time. In vitro cytotoxicity study: MTT assay was conducted to investigate photodynamic therapy and cytotoxicity. Typically, U87MG cells were seeded in a 96-well plate at a concentration of 5,000 cells per well and cultured at 37 °C, 5% CO2 for 24 h. The cells were washed with fresh medium and then corresponding MOF nanoparticles were added. The cells with MOF nanoparticles were incubated at 37 °C, 5% CO2 for 48 h. Then, 10 µL of MTT (5 mg/mL in PBS) was added to the cells and incubated for 4 h. Finally, the medium was replaced with 100 µL of DMSO. The absorbance of each well was measured at 490 nm with a plate reader. Confocal microscopy: The U87MG cells were first seeded in an 8-well Lab-Tek cover-glass slide with a concentration of 25,000 cells per well. MOF nanoparticles were added and incubated with cells for 2 hours at 37 °C, 5% CO2. After washing with PBS for three times, Z-Fix solution was added to fix the cells at 37 °C, 5% CO2 for 20 min. Mounting medium with DAPI was then added to stain for 30 min. Confocal images were obtained from a fluorescence microscope (Zeiss LSM 780). Live and dead assay: Cell live/dead assay was conducted with a staining kit. U87MG cells (25,000) were seeded in an 8-well Lab-Tek cover-glass slide for an overnight incubation. ZrMOF and ZrMOF@MnO2 nanoparticles were added and incubated with U87MG cells for 5 hours. Subsequently, laser irradiation (650 nm, 0.2 W/cm2) was applied for 5 min. The Calcium AM/PI working solutions were added to cells and incubated for 30 min. The cells were then washed with PBS after removing the cell culture media. The slides were finally observed under a fluorescence microscope. MOF: metal-organic framework; ZIF: zeolitic imidazolate framework; GSH: glutathione; FRET: fluorescence resonance energy transfer; TEM: transmission electron microscopy; XRD: X-ray diffraction; DLS: dynamic light scattering; PBS: phosphate buffered saline; SOSG: Singlet oxygen sensor green; H&E: hematoxylin and eosin. The supplementary material includes the characterization data of XPS, TEM, Flow cytometry, Confocal imaging, and XRD used in this study. This work supported by intramural research program of the National Institute of Biomedical Imaging and Bioengineering (NIBIB), National Institutes of Health (NIH), the intramural research program of Faculty of Health Science, and the Start-up Research Grant (SRG2018-00130-FHS) at the University of Macau. Y.L., Y.D. and X.C. conceived the idea and designed the experiments. Y.L., C.G., L.L., Y.L., Z.Y., Z.W., G.Y., S.W., W.F., L.H., and G.N. were primarily responsible for the data collection and analysis. Z.Z. and Z.S. performed the in vitro and in vivo MRI. Y.M. performed LC-MS. Y.L., Y.D., and X.C. analyzed the data and co-wrote the manuscript. All authors discussed the results and commented on the manuscript.